The IRS has recently updated its online calculator, which helps taxpayers gage the right amount for their payroll tax withholding. Use this tool to make sure you are not paying too much or too little in taxes this year. The new tax law passed by Congress last fall will affect 2018 taxes. It is a complicated law and the IRS will not issue new w-4 forms until 2019. Until the agency releases the new w-4, this calculator is the best way to see if you need to make tax withholding changes. You complete a w-4 form when you take a new job or face a major life change (marriage, new baby, etc.) Your employer uses your w-4 information to set the right number of withholding allowances for your paycheck. While you may not have any major life changes, you may need to change your withholding allowances due to the changes in the tax law. The new tax law, the Tax Cut and Jobs Act (TCJA), made significant changes to standard deductions and to tax brackets. The law also removed personal exemptions, increased child tax credits, eliminated certain deductions, and made other changes. These changes may affect the amount of taxes you owe at the end of the year. You can read more about the tax changes for married couples in our previous post on the marriage penalty. Tax experts are strongly suggesting that individuals with complex taxes use the calculator mid-year to avoid end-of-year problems. After you complete your 2017 taxes, due on April 17, you should use the calculator to see if you need to make any changes to your deductions at work. To make using the calculator easy for you, gather the following information before you start the calculation. Your 2017 tax return — Use this as general info to estimate your 2018 income and remember the IRS made major changes to standard deductions. Your most recent pay stub — which will tell you the amount your employer has withheld from your paycheck up to this point in 2018. Pay attention to the line on your pay stub for Federal Withholding. You can view the IRS calculator at this link. You can read additional information from the IRS on completing a 2018 w-4 at this link. Once you complete the calculation, determine if you should submit a new w-4 to change your tax withholding amount. The fewer allowances you enter on your w-4, the higher your tax withholdings. For example, an individual listing “1” allowance will have more taxes withheld than someone listing “3” allowances. Of note: If you do not have the proper amount withheld, you can owe a penalty at the end of the year. 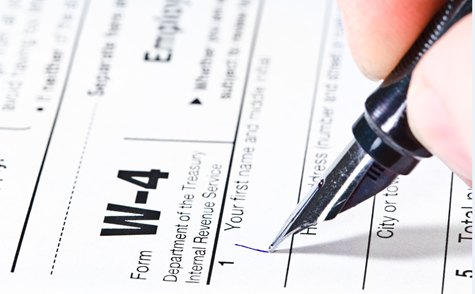 If you do need to complete a new w-4, do so and submit it to your personnel department. Feel free to contact us, if you need help determining your proper tax withholdings.